Taking pride of place on Currumbin hill, overlooking the pristine creek and out to the surfers skyline is Copper House, Sanctuary28’s recently completed three-storey project. 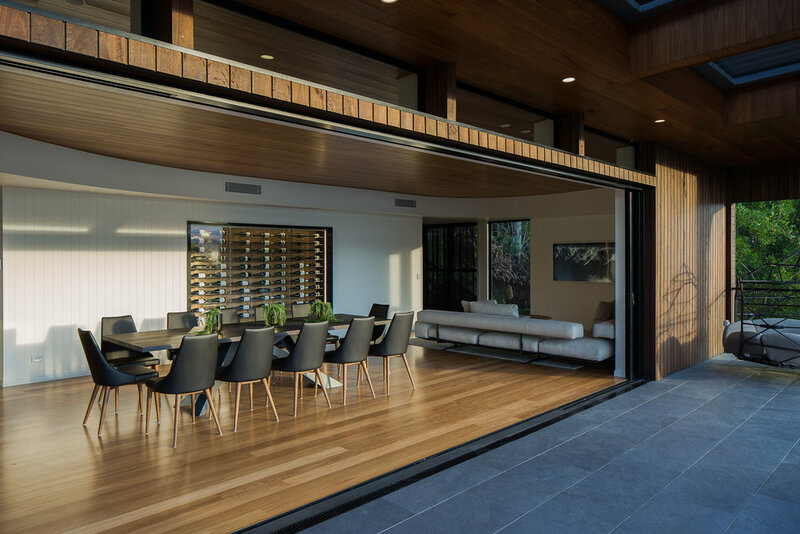 Renowned Architect Paul Uhlmann was commissioned to design a functional family home but with a signature style that would stand the test of time. The exterior facade is unique with its shapely curves. Copper cladding is a standout feature, wrapping two levels. Circular balustrade screening provides an artistic element as well as privacy to the carport. 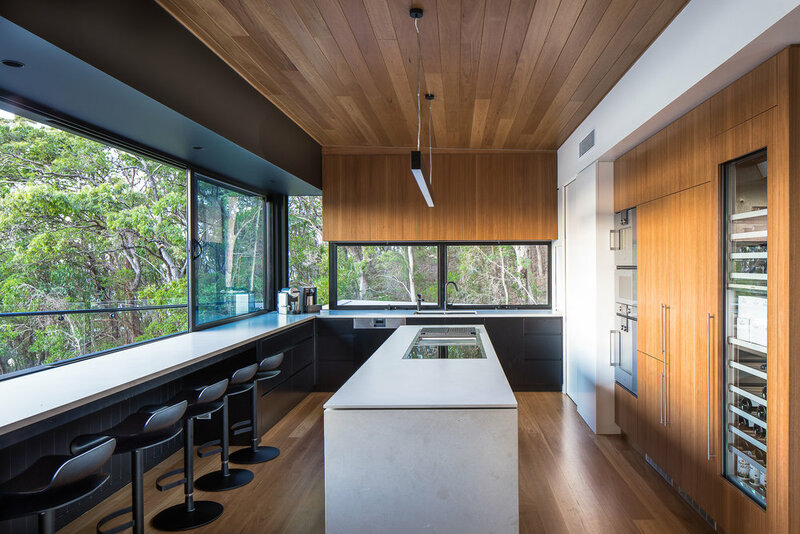 Timber is a dominant feature of this home, used extensively, inside and out. The staircase wraps around a blackbutt feature wall, visually appealing when seen from the transparent lift shaft. Level 1 is dedicated to sleeping. Galley style rooms with slideaway walls has catered for this large family. A locker style laundry cupboard assists with daily organization. The bathrooms are sleek and hotel inspired. The top level is the heart of the home. Dedicated to living. A glass wine display takes pride of place in the dining room. 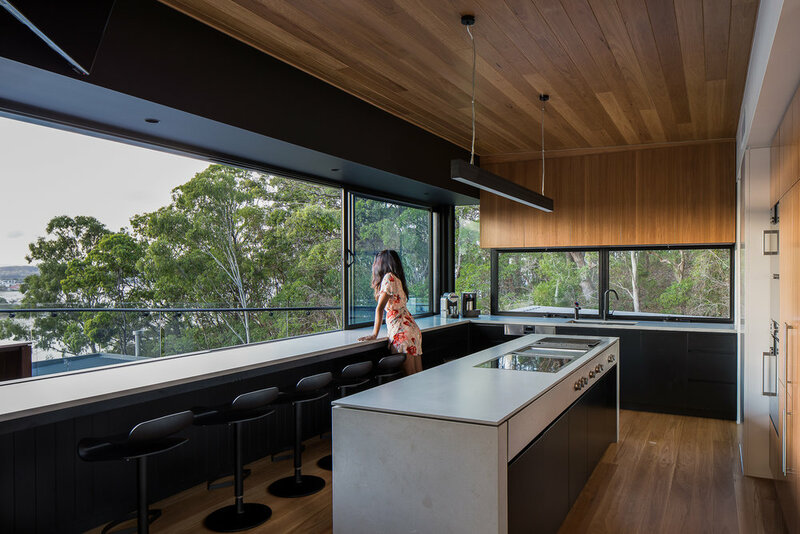 The timber curved ceiling adds depth and warmth. The view is breathtaking, equally beautiful day or night. This level has restaurant quality ambience, an entertainer’s delight. Guests are in for a treat as they are also located on this level. The ideal location paired with a striking facade sets this home in good standing to becoming one of the Gold Coast’s iconic homes. Be sure to check back as we will have more photos of this beautiful home soon. Welcome to 'Happiness House'. Winner of ‘Best Contract House’ within price category. A great result for our construction team, client and architect Scott Carpenter. 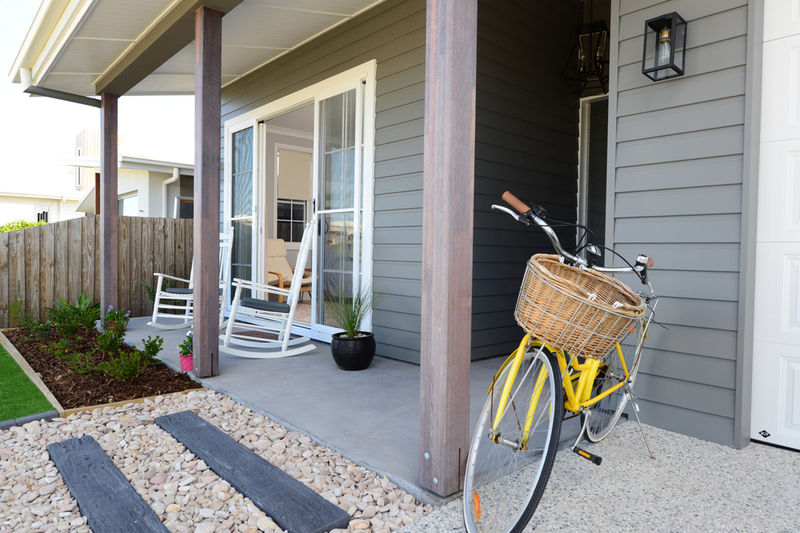 This home is located in the sleepy coastal town of Cabarita. The home is a perfect blend of Industrial meets modern style. As a photographer, our client Vanessa is always on the search for the right light. 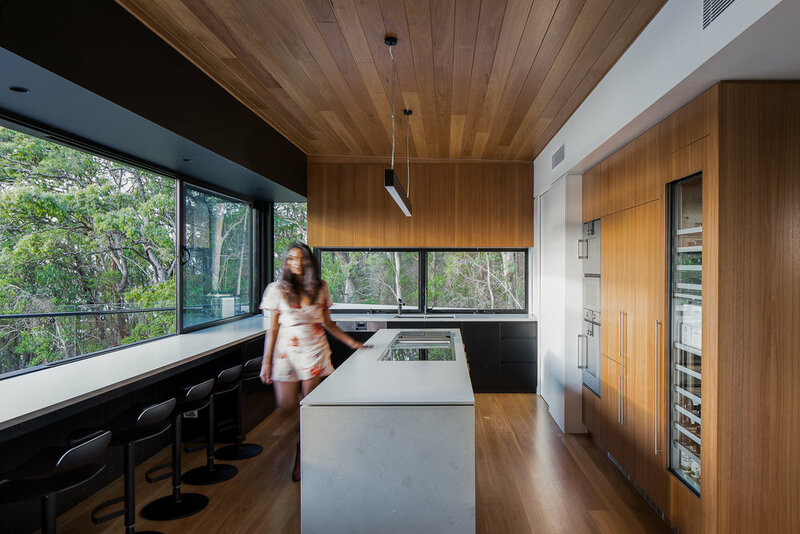 It is fitting that her two storey home has been designed so that key living areas are bathed in natural and filtered light. 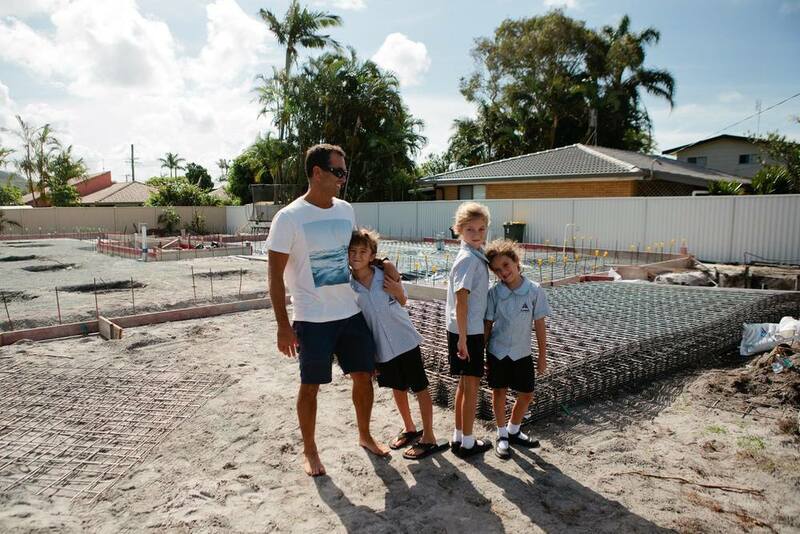 Well it has been an exciting day onsite at Luke Hine's residence in Casuarina. Today his new kitchen got installed. Not only was it a big and exciting day for us but also for our cabinetmaker. We catch up with Luke's very talented kitchen designer Katia Slogrove from Germancraft Cabinets. Katia, you must be super pumped that your kitchen design for Luke Hines is coming to fruition. Is this the first celebrity client that you have worked for? Yes I can’t believe it’s finally happening. I have been crossing off days on my calendar for this day! To see your design come to fruition is my favorite part of my job. This is not my first celebrity client I have done joinery and kitchens for Olympic swimmers, athletes and tv celebrities. Don’t want to name drop but they were all really nice clients and I don’t treat them any different to our everyday clients we get. Tell us about the kitchen design, what was your brief, what was important to Luke? I was lucky enough because believe it or not Luke has given me quite a lot of freedom in the design which I didn’t expect from a professional Chef. When I was designing this kitchen I was pretending that I was a chef in my mind. I started thinking how I would use this space and where would my items and food be stored. The functionality of this kitchen was the most important thing and that was part of Luke’s brief. But one thing he did mention to me is that he has a lot of spices! What are the materials/products to be used in this kitchen? I have used Black and Ash white colour 2pak both in matt finish for my doors. However when you open your drawers or doors this is where it gets interesting because we have used Laminex Impressions “Sublime Teak to all carcass! After all it is Scandinavian concept and we thoughts it was a perfect area to introduce a bit of timber in to the scheme. I have also used mirror laminate to all his kick boards as I knew that he was going to have an amazing concrete flooring and by placing a mirror laminate on the kicks the floor will simply continue on and the kitchen will look like its floating! My favorite part is probably all the Blum hardware I have put in. We have 34 Legrabox Pure drawers! They are completely brand new to the market and are considered to be Best drawer systems in the whole world! Of course I have picked the Terra black matt and glass profile to tie it all in into the Scandinavian look. But they are not just normal drawers they are all on servo drive which means you touch them slightly and they open automatically! We have entire black wall where his VZUG appliances are all on touch servo drive system with automatic lights too! When he will open his pantries or spice pantries the light comes on automatically like a magic trick. The last and the most impressive Is the Servo drive Flex mechanism we have put on his Fully integrated fridge and freezer doors. Again completely automatic he touches the door panel and the fridge doors open and they also automatically shut by themselves if Luke will ever forget to shut his fridge! What’s your advice for someone looking to design a kitchen? Design your kitchen layout early. Go and see a professional to help you design your dream kitchen and then give your plans to the architect so he can integrate that kitchen design and layout into the floor plans.